First off is that I had never noticed the snow. Look at the ledges and rooftops below. They are coated lightly with snow. Not very important in terms of the photo itself, but very interesting to know in order to "place" yourself with the photographer and, in as much as possible, feel what she felt while taking the photo. In this case, in spite of a lack of wind being evident, at the 61st floor she would have felt very cold. The second thing which caught me by surprise is that she is not kneeling at all. She is standing in a little pit, somewhat akin to the "apple box" on stages where cue cards were once used. There is another name for it, but it escapes me at the moment. I had always read the captions which invariably stated she is kneeling. And, at first glance, it does look that way. But, armed with modern technology; as we all seem to be; when you blow the photo up a bit you notice the pit and see that her right leg is bent, indicating she is standing on something, with her left half clearly below the surface of the eagle. So, now I needed to know if there was, or still is, a tunnel leading from the inside of the roofs parapet to the opening on top of the eagle. Apparently though, some questions are destined to remain unanswered. I called the management company in Dallas; 90 per cent of the property is owned by Abu Dhabi; and they connected me with the property in New York. Tishman-Specter owns the other 10 per cent and is the active manager of the property at 405 Lexington Avenue. 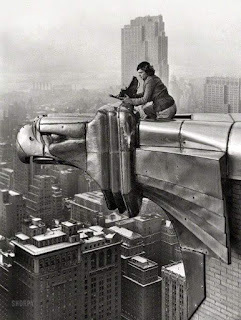 Not only did the building employee I spoke with at the Chrysler Building have no knowledge of the photo, she couldn't have cared less about even trying to understand my question. Contrasted with the employee in Dallas, who had likewise never seen the photo, but bought it up on her computer to gain a better understanding of the topic at hand, the employee in N.Y. was alternately uninterested and even a bit hostile! Finally I got connected to Maintenance. When I was a Estimator I always looked for the lowest employee in the Maintenance Dept. Many times they have been there the longest and have a reverence for the history of the building where they spend about 1/3 of their lives. Unfortunately, in this case, that was not the case. In addition to the lack of any knowledge about the subject in Maintenance, security also prohibits them from discussing any structural aspects of the building. So that was that. It was a short reign, as the Empire State Building opened shortly after, within about a year. One of the things I learned was that the building never had any real connection to the auto company. It did rent a showroom on the ground floor, but basically Mr. Chrysler built the thing so that his kids would have "something to be responsible for." There was also once a Cloud Club up by the Observation floor and some hidden apartments for the executives. 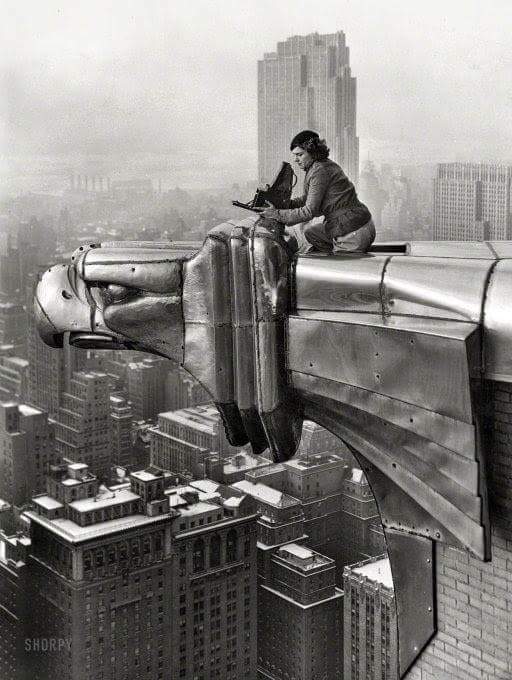 Margaret Bourke-White actually lived on the 61st floor; where she took the iconic photo in 1934. Her employer, Time Inc. had to co-sign for her as the policy at that time was not to rent to a woman. They charged her $387.92 a month in rent. She was also prohibited from using the terrace, as women might be prone to "emotional distress". It was a rule she never observed, nor was it ever enforced against her. When the building first opened in 1931 you could go up to the 71st floor Observatory for 50 cents and see almost 100 miles in any direction. That was actually at the base of the spire. I understand you can still tour the building, but not to the extent which was once possible.